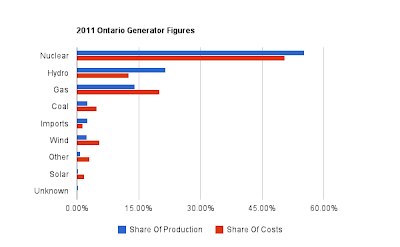 I haven't posted lately as I've revisited data to provide improved estimates of a number of entities in Ontario's electricity system. I've tried to do so in a manner that can be easily updated, and written some descriptions of the process, in a lengthy entry at my data site (users with slow connections are warned). Since I've put the time in building the data structure to support posts, I'll grab some of the data to illustrate the types of figures that can be produced, albeit as estimations with imperfect data, depended on a number of assumptions. I worked the data to estimate the net contribution of each generator to the global adjustment. By "net" I mean the difference between what the end consumer pays for the generator's output, and what the generator receives. In a world of perfect data, this method would balance to $0. Aside from working on figures to show the relative costs of each supply, I also indicate a breakdown of costs comprising the Class B commodity charges that most bills in Ontario are based on - the exception being the large Class A customers. 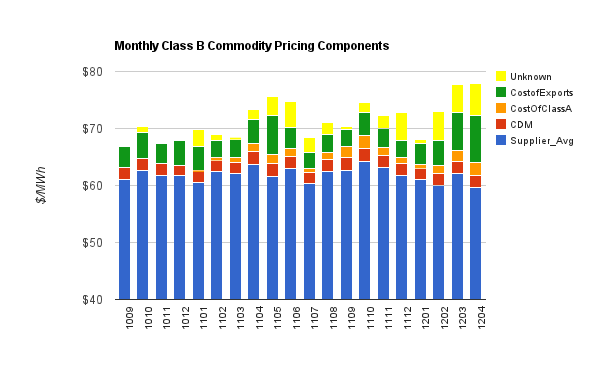 The breakdown includes the cost of the OPA's consevation programs, the addtional burden on Class B customers creating by the creation of the Class A category, and the cost added by selling exports cheaply. remain in your dog. Dog Training Using Praise.